In the beginning there was some confusion surrounding the taxonomy of Fusarium and its over 1,000 species, varieties and races. But as people started to understand that Fusarium causes serious disease, the need for a precise system of classification became more urgent. Nowadays, scientists still debate the system of classification that includes between nine and about fifty species, zero to 29 varieties and zero to twelve forms. The brown external petiole stripe corresponds with internal discolouration of the petiole. This is an example of fusarium foot rot, distinguished by a canker that shows a dark brown discolouration of the stem. Due to the confusion in identifying many Fusarium species, the classification is also based on the plant’s symptomatology. This means that most of the species have been divided into groups according to the type of disease that they cause, such as the species groups for Fusarium stem canker, Fusarium foot rot and Fusarium wilt. 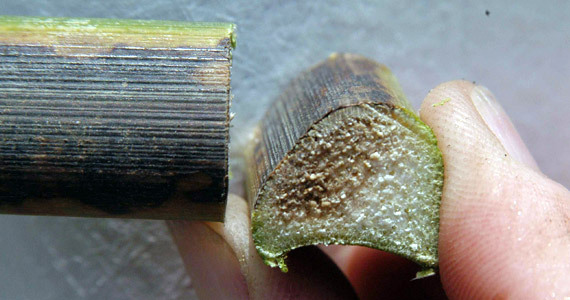 The Fusarium stem canker group is a soil fungus caused by six species (F. sulphureum, F. graminearum, F. lateritium, F. sambucinum, F. avenaceum and F. culmorum). Fusarium foot rot and root rot group is a soil fungus caused principally by F. solani. 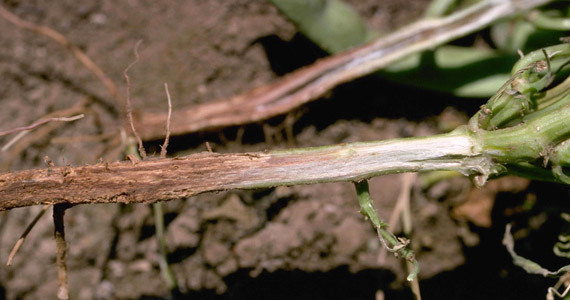 Fusarium wilt group is a vascular fungus caused by a xylem pathogen called F. oxysporum. Within this group, F. oxysporum has several specialised forms – known as formae specialis (f.sp.) - that infect a variety of hosts to cause a range of diseases. F. oxysporum f.sp vasinfectum and F. oxysporum f.sp. apii cause damping-off and both are morphologically identical but the host changes, giving the names of the sub-species. However, the debate on this classification system is far from over, since many scientists suggest that F. oxysporum f.sp apii is from the same group as f.sp vasinfectum. Because of this, the characterisation of sub-specific groups is now based on the generics of the fungus rather than on the host-pathogen interaction. F. oxysporum f.sp.cubenses is a clearly defined sub-species that causes the Panama disease of Musa spp. It was this pathogen that caused the disappearance of the banana cultivar ‘Gross Michael’, after which a new banana variety, ‘Cavendish’, was introduced due to its resistance to Fusarium. As in banana, extensive breeding for resistance to Fusarium spp. is in progress in a wide range of crops, notably cereals, cotton, potato and tomato. Fusarium colonies can be pale or brightly coloured (depending on the species) and may have a cottony aerial mycelium. The colour varies from whitish to yellow, brownish, pink or reddish. Species of Fusarium typically produce spores (called macro- and microconidias) to reproduce and disseminate themselves. 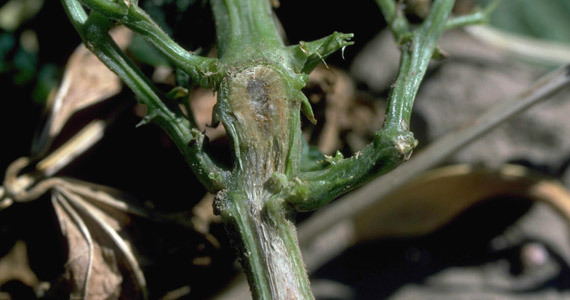 Fusarium stem canker symptoms begin with an epidermal lesion, followed by chlorosis and necrosis. Close to the lesion, the trunk, branches or stems will normally swell creating a canker that can split open. Leaves on affected stems wilt and necrose, without falling off the plant. This pathogen is also able to infect seedlings, in which it causes damping-off. Because of host symptomatology, Fusarium foot rot may easily be confused with Fusarium stem canker because both of them cause a canker. However, Fusarium stem canker leads to a reddish xylem discolouration while Fusarium foot rot is distinguished by soft, dark or black cankers that show up as dark brown discolouration on the stem. Fusarium solani (root rot) is a saprophytic fungus, which means it can colonise dead or dying plant tissue. The fungus can invade stems at the nodes or at the soil line, taking advantage of wounds. Its spores will germinate during prolonged periods of high humidity and temperature. 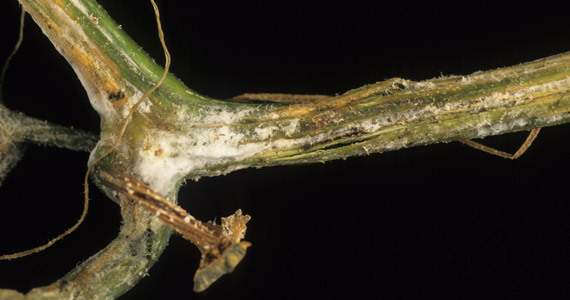 Fusarium oxysporum (wilt) is also saprophyte fungi that can survive in the soil between crop cycles in infected plant debris. The fungus can survive either as mycelium, or as any of its three different spore types. The roots can be infected directly through the root tips or wounds. Once inside the plant, the mycelium grows through the root cortex until it reaches the xylem and later, throughout the vascular tissue of the whole plant. This condition progressively limits water and nutrient uptake, the leaves wilt, and the plant will eventually die. Reducing plant stress will limit the favourability of conditions for the fungi to spread. Ensure that you use clean and disease free seeds or plantlets. Avoid overwatering, deep planting, over fertilising with nitrogen or phosphorus, and injuring plants when planting. Cultivating, harvesting, and sorting are some of the practices that can help prevent the spread of Fusarium.